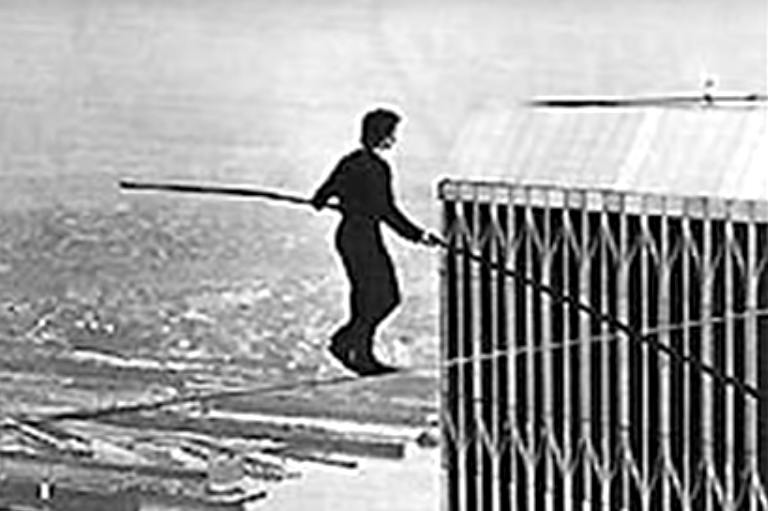 Philippe Petit accomplished something nobody in the entire world will ever be able to do ever again. They couldn’t even if they tried. It’d literally be impossible. On August 7, 1974, the Frenchman pushed one foot off the ledge and danced across a tightrope strung between the Twin Towers in New York City. The Twin Towers, which were once an American symbol of strength and power, stood at a staggering 1,368 feet. Before the Sears Tower was built, they were the world’s tallest and largest buildings ever constructed. When construction began in 1966, it wouldn’t take long for the artist to come across an article written for the project. While seated in the waiting room at a dentist’s office, he came across an illustration and immediately knew this was going to be a turning point in his life. For the following six years, Petit arduously cultivated his seemingly impossible dream. He spent countless hours working on his high-wire skills and finding out everything he could about the World Trade Center. When the moment came to take his leap of faith, he stepped onto the wire and danced back and forth eight times before surrendering himself to the police. Sgt. Charles Daniels of the Port Authority Police Department was dispatched to the roof to bring the daredevil down, but could only look on in absolute amazement. The performance was something that no one watching will ever forget, or those who helped him achieve his dream. It was truly a once in a lifetime moment — never to be recreated. The steel cable hung a quarter of a mile up in the clouds above the 130-foot gap separating the two towers. A captivating documentary was made about his amazing feat called Man on Wire. You can find the film on Netflix. Trust us: It’s worth watching.